The new student ID cards will feature a vertical layout and expiration dates. Temple will issue new Owl Cards to students and faculty during the 2012-13 school year to better accommodate the new state voter identification law. Upgrades include expiration dates and new electronic features. 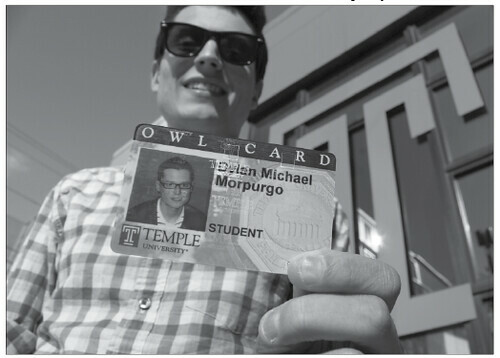 MATT FLOCCO TTN file photo Dylan Morpugo advocated for new Owl Cards to be issued after the voter ID law was passed.Temple will issue new cards to all students in the fall to comply with the law. “We expect we will probably reissue returning students during the first week of the fall semester,” Scott Brannan, director of the Diamond Dollars office, said. New and transfer students will receive their Owl Cards during orientation sessions. The voter identification legislation, which was signed into law by Gov. Tom Corbett in March, requires voters to present a form of photo identification at polling stations before they are allowed to cast their ballot. Identifications without an expiration date – like the current Owl Cards – are not accepted by the law. New Owl Cards will expire in September 2018. University policy requires new cards to be issued every six years. The most recent Owl Cards were designed in 2005. Barbara Dolhansky, associate vice president of Computer Services, said the voter identification legislation passed at the perfect time for Temple to add the date to new cards. Dolhansky cited Penn State’s issuing of stickers printed with expiration dates, which students can place on their university identification at their request. Penn State said in a press release that during the next three years, the stickers will be “phased out” when new cards are printed with expiration dates. New Owl Cards are allocated from the university’s operational budget. Anthony Wagner, executive vice president, chief finacnial officer and treasurer said in an email that the new cards is being done in conjuction with Temple’s regular card update. The cost will be between $225,000 and $250,000, Wagner said, noting that it did not cost more to include an expiration date. They will also function as PNC Bank ATM cards, a decision Brannan said “PNC has wanted to do for many years,” given Temple’s relationship with the bank, as well as the number of PNC ATMs on Main Campus. “I think it made sense. A lot of students do take advantage…because they’re on our campus,” Brannan said. “You wouldn’t have to carry your ATM card,” Dolhansky added. The decision to update the cards was not approved by the Board of Trustees, Dolhansky said, but was given to President Ann Weaver Hart for approval. Brannan said the “biggest” new feature for the cards will be their wave technology design. Using new Owl Card technology will allow people to “tap and go” when entering a building or entering a Temple parking structure. At university food locations, students will be able to hold their cards near a sensor rather than be swiped in at a register. While returning students will not be required to take new pictures, faculty and staff will have the option to retake photos. “There are a lot of employee photos that are very old…15 years or more,” Dolhansky said. Dolhanksy and Brannan said at the moment the plan to offer returning students a period of time to pick up new cards has not been finalized, although Brannan said new cards will not be mailed. Returning students and faculty will be required to present old Owl Cards and a second form of identification when receiving their new card. Dolhansky advised that students hold onto their old cards until the all new cards are activated simultaneously. $250,000 is a drop in the bucket. The salary of two-full time instructors, basically. Nothing to get up in arms about, especially considering the need for updated cards. I’m sorry, but you think the average full-time professor here makes $125,000? You are sadly mistaken sir.